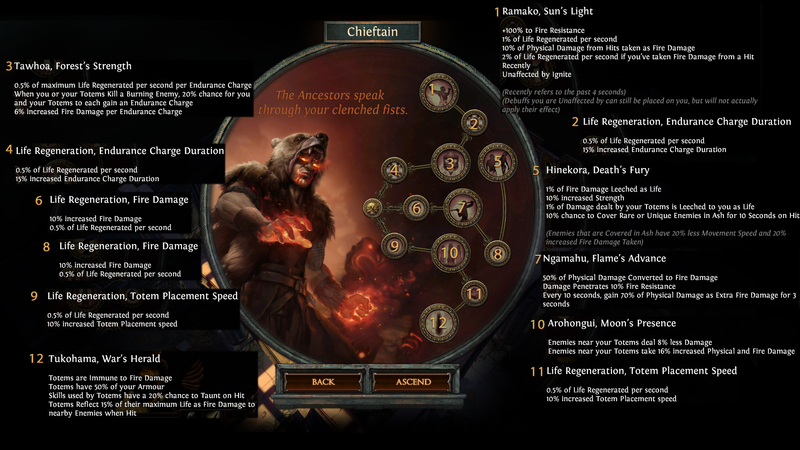 3.2 changes to Chieftain pretty much make it perfect fit for Ngamahu Flame so I decided to make a build for it utilizing Elemental Overload. Resolute Technique skill trees are included in the guide for league starter. Why is Chieftain good for Ngamahu? Chieftain ascendancy = free Xoph's Blood. Free Molten Burst that does impressive damage with huge AOE granting high clear speed. Requires 0 link. You just want to pop support gems into this weapon to buff Molten Burst. Above is a sample of how an elder amulet should roll like. Refer to Recommended Rares section for preferred rolls. Special thanks to @DeGyrst for providing a GG sample (Woe Medallion shown above). Watcher's Eye provides very good damage boost to the build when you run Anger aura. Tombfist with Curse Enemies with Level 10 - 12 Elemental Weakness On Hit allows you to drop Flammability curse. - Watcher's Eye is optional. Impresence 0% mana reservation enabling you to use another aura (i.e. Anger). Provides very good damage boost to the build when you run Anger aura. If you are not able to obtain the above stats, prioritize "Gain #% physical damage as extra fire damage while affected by Anger". Loreweave is the perfect chest for Elemental Overload skill tree. Provides attack speed, dexterity, critical strike chances and huge amount of life. Provides attack speed, movement speed, dexterity and chaos resistance. Up to 50% increased Cyclone damage, 25% increased attack speed, 10% increased movement speed. You can run with 5L. Main drawback is the lack of defense stats. Bronn's Lithe provides great damage buff to the build. Thanks to @Lunartuna for testing it out. Shrouding is the perfect chest if you are running Cremation + Cast on Melee Kill setup. 20% more AOE radius, great clear speed, comes with all resist and decent life. You can run with 5L. Belly's large life pool couple with Windscream's +1 curse (for Enfeeble), you can easily reach effective life pool of 8300. Great setup when you are focused on leveling. Cons: You have to skip hexproof maps as curse do not work on the mobs. Similar to Belly + Windscream, Cospri's Will with Enfeeble works great for leveling and your curses work in hexproof maps too. Run this ring to shatter ignited mobs. You have to drop Elemental Focus to gain ignite. Great for handling porcupine mobs. 29% chance to gain endurance charge on kill (with Diamond Skin). A lazy man approach to gain endurance charges without self casting Enduring Cry. This jewel is pure luxury. Swap Elemental Focus to Chance to Ignite for ignite damage over time. My personal preference will be to run Ignite on Axe and Elemental Focus on Cyclone. Replace with Concentrated gem for boss fight. For players who are aiming for 3R2B1G but gotten this color instead, you can definitely stick to it as it does more damage than 2R2B2G. You can replace Elemental Focus with Combustion for mapping. You can replace Concentrated with Ignite Proliferation for mapping. Replace with Fortify for more toughness. You can replace Warchief with Protector for stationary boss (e.g. Shaper) fight. Important: Immortal Call needs to be level 20. - You will use Enduring Cry (more reliable than Tawhoa) to gather endurance charges when there are a few mobs near you. Re-cast Enduring Cry to refresh the duration. - For physical damage traps, manual cast Immortal Call (you should be immune to traps damage for 7+ seconds) and run through them like a boss. For Elemental Overloaded skill tree, you will want to use Ice Golem. For Resolute Technique skill tree, you will want to use Lightning / Fire Golem. You can swap Flammability with Enfeeble (level 13) for leveling. This setup provide more resistance reduction to mobs and enabling Blood Rage to provide more attack speed. Main drawback is the intelligence requirement is steep (155 needed). NOTE: You will want Enhance 4 to maximize the setup. Anti-freeze for Quick Silver flask. IMPORTANT: To run this setup, ensure your overcapped fire resistance is at least 50% higher than overcapped cold resistance and highest among all resistances. Add Knockback for Basalt flask (to fight Argus in Uber lab). To: @noneskii and @ADM0N for pointing out Atziri's Promise to be a viable flask for the build since Chieftain is not restricted by Avatar of Fire. 3 different skill trees. 2 of which are budget and league starter friendly. Re-specing from 1 set to another will cost between 10 to 30 regret orbs. Following pastebin is based on gears (tailored for EO skill tree) from my SSF Standard Chieftain character. If you are playing in trading league, you will be able to acquire better gears and have better stats. To @AvengingTenshi for fixing the POB by including Chieftain's 70% extra fire damage every 10 seconds for 3 seconds and pointblank. To @lemosvini, @CrownedClownSs and @noneskii for pointing out that this path is more budget friendly. Priority listed is top (best) down (worse). NOTE: Besides the skill gems listed below, you can also switch and stick to Cyclone and use that for leveling from level 28 onward. Remember to socket Cyclone gem into alternate weapon and level it at the same time when you reach level 28. Q: What are the pros/cons of Slayer vs Champion vs Scion vs Chieftain? Q: How much accuracy should I aim for? At least 600 on gears / jewels. You want to aim for 90% chance to hit. Q: Why do we pick Point Blank from the skill tree? Molten Burst from Ngamahu are projectiles and Point Blank will provide 50% more damage to the balls. Q: I am confused as to what aura to run if I am using (or not) Impresence. Q: What is the easiest way to get 3R 2B 1G on Bronn? If your Bronn is 6L, Vorici's bench with 2R 1B combination is your best bet. Q: What priority of gems should I focus on to get it to 20% quality? Physical damage gems, concentrated gems gets the priority but eventually you will want all gems to be 20/20. Personally, when a gem hit level 20, I just vendor it with 1 gemcutter's prism for a level 1, 20% quality gem and level it all over again. @Hitoseijuro wrote a very comprehensive reply on the specific gems to GCP in Slayer's version of the build. EDIT 1: Added defensive path for Ascendancy and updated FAQ. EDIT 2: Updated flasks section to include Atziri's Promise. Special thanks to @noneskii and @ADM0N for pointing out Atziri's Promise to be a viable flask for the build since Chieftain is not restricted by Avatar of Fire. EDIT 3: Added Uber Lab runner skill tree and recommended Immortal Call setup (gems section). EDIT 5: Updated skill tree for patch 3.4. 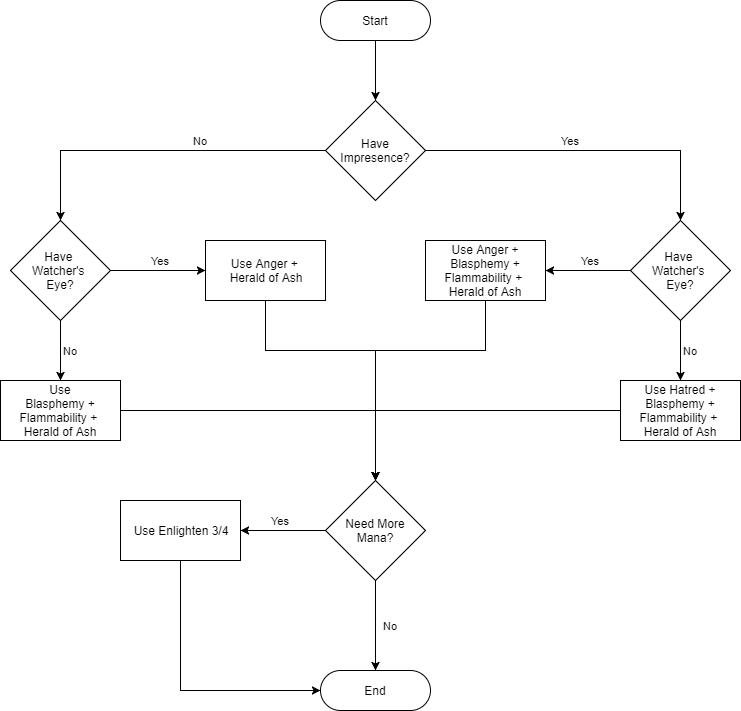 EDIT 6: Added Consecrated Path setup. Tukohama War's Herald is better choice because it makes Protector/Warchief totem behave like Decoy and they reflect 15% of maximum life as fire damage when hit by mob. 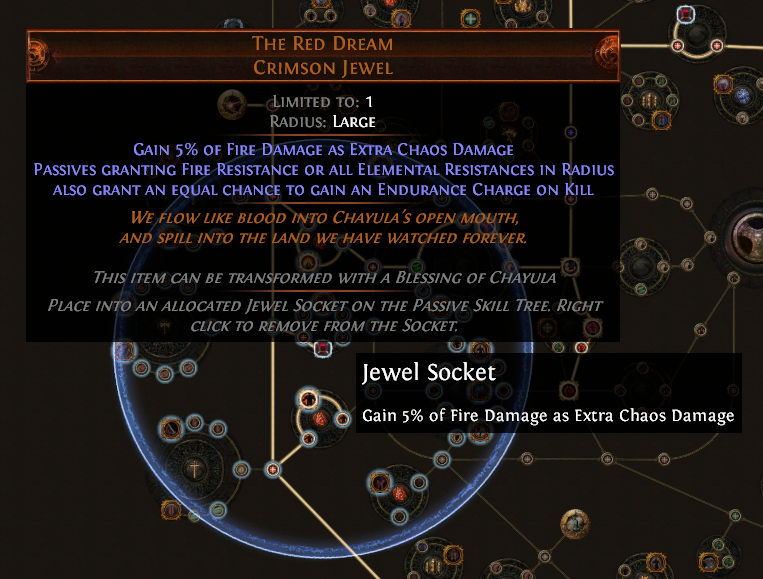 Tawhoa Forest's Strength generates endurance charges on kill and Red Dream jewel will be able to replace it easily. I think it should take into consideration that it is a good cheap option for those who are starting. 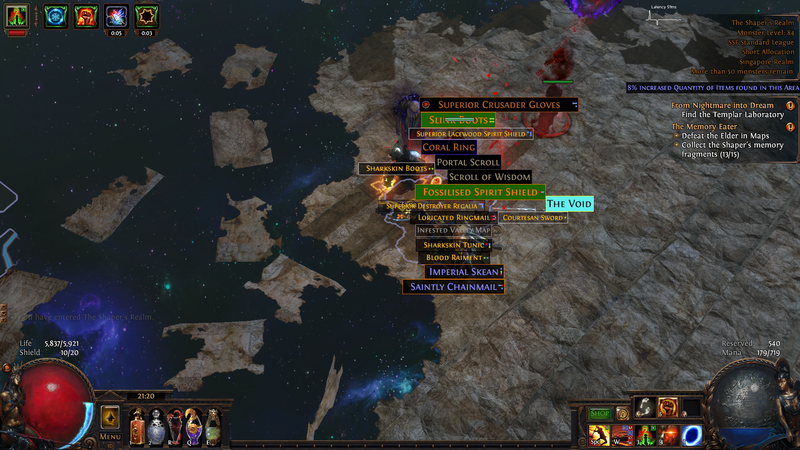 I'll probably go SSF next league so I don't know if i'll be able to play Ngamahu again ... Anyway I have several questions. How do you plan to proc effectively EO ? Is it worth to drop RT for it ? we will need to invest a lot in accuracy then. And finally the slayer version was really solid thanks to the leech, here I don't see so much investment in defenses, do you think VP + totems taunt will be enough or do you expect some changes to the leech that are not mentionned here. What if you combine the Chieftain ascendancy and the Xoph's Blood? Will the 100% conversion of physical damage be a fire damage? And is there any point in this? At base 5% crit chance, with high attack speed and 90% chance to hit, you should be able to proc Elemental Overload frequently. At least 80% of the time during mapping, and 90+% during boss fights. This is the same as the EO skill tree in the Slayer build. If you push your crit chance to around 14%, you will pretty much have 100% up time for EO. FYI, Slayer EO provides higher damage than Resolute Technique version when you have the proper gears for it. In terms of toughness, Chieftain is pretty much the same as Slayer. With Vaal Pact, you will have enough life per second to keep you alive. And just like Slayer, dropping Flammability for Enfeeble curse is great for leveling your character. How do you think this build compares to Ahfack's Crimson Cyclone build in terms of both DPS and survivability?